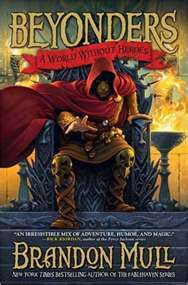 Brandon Mull may not be the smoothest writer, but he’s infinitely creative! Jason is aided by a “displacer” a wizardborn race who can remove their body parts and reconnect them at will, and by an Amar Kabal, a race that can die and grow anew from a seed at the base of their skull. He’s hunted by manglers, conscriptors, even a torivor, and he must duel an evil nobleman to the death with billiard balls. But with the help of another Beyonder named Rachel (from Washington), he perseveres. Ever he looks for a way home, but he also keeps in mind the words of Galloran, the noble Blind King who challenged Maldor and failed, “heroism means doing the right thing regardless of the consequences.” Lyrian’s quest becomes his own. On the downside, A World Without Heroes contains several bloody moments. Jason has undertaken a quest that sets him in opposition to a great evil, and there are casualties. Also, the book begins with the sounds of torture echoing through Maldor’s dungeon and with Galloran’s memories of suffering (both instrumental in turning me off). And The Book of Salzared is a little gruesome, bound with that man’s warm, living flesh and inscribed with his blood. Other than these squeamish moments, the book is clean, unobjectionable and infinitely intriguing. The next two installments in The Beyonders series are due out in spring 2012 and spring 2013. I started to read this book and lost interest. Sound like I should have stayed with it. I’ll give it another try!